I didn’t grow up eating shepherd’s pie, but since making this recipe I have fallen in love! 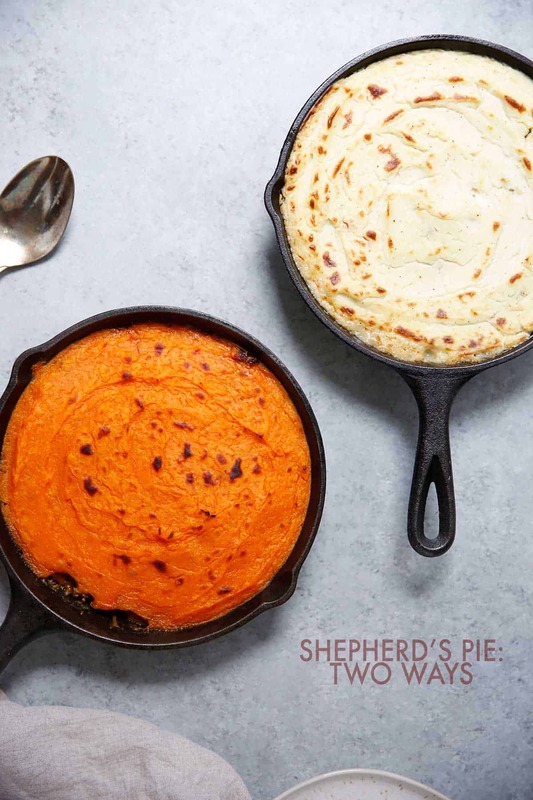 This Shepherd’s Pie: Two Ways is such a perfect Fall dish when you are craving something hearty and comforting. 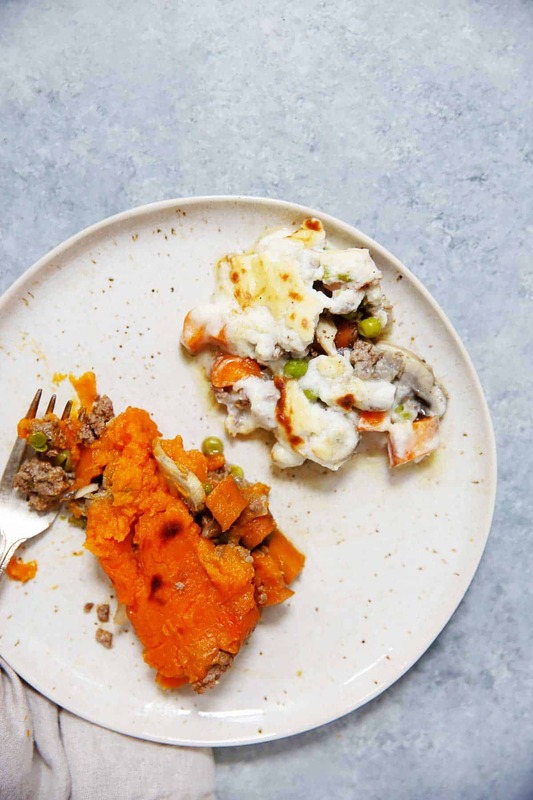 Loaded with protein, Fall veggies, and topped with creamy sweet potato or cauliflower mash for a low-carb alternative! If you love mashed potatoes as much as I do, this is a must-try! Savory Sunday is back and this week’s recipe is a good one! I can’t believe it is Sunday. This weekend was relaxing and productive on my end. Speaking of the last post, did you guys kick it into gear with your November goals? I am pushing hard in my workouts this month. How do you feel about comfort food? This definition kind of bothers me for some reason. Maybe because I feel that food shouldn’t necessarily be what provides one with a sense of well-being or consolation, and I don’t generally find comfort in high sugar or high carb dishes, but I do find comfort in meals associated with home cooking. This week’s Savory meal idea is perfect for the Fall! Healthy comfort food made TWO ways, to satisfy everyone in your home. In a large cast-iron skillet, heat oil and garlic over medium-high heat just until fragrant, about one minute. Add onions, mushrooms, carrots, and frozen peas. Sauté over medium-high heat for 5 minutes or until the onions are translucent and the carrots start to soften. Add ground beef and let cook over medium-high heat until brown and no pink remains. Stir often. Add in beef or chicken stock, sea salt, and black pepper. Taste and adjust seasoning as desired. Reduce heat to low and simmer for 8-10 minutes. Take off heat and set aside. Add roasted sweet potato to a medium mixing bowl or high-speed blender. If using a mixing bowl, mash the sweet potato well before adding in the rest of the ingredients. If using a high-speed blender, place all of the sweet potato mash ingredients in at the same time, and blend until smooth. Steam cauliflower until soft, about 5-7 minutes. Place cauliflower and the rest of the cauliflower mash ingredients in a medium mixing bowl or high-speed blender. Mash or blend until smooth. Taste and adjust seasoning as desired. Divide beef mixture between two similar sized cast iron skillets. 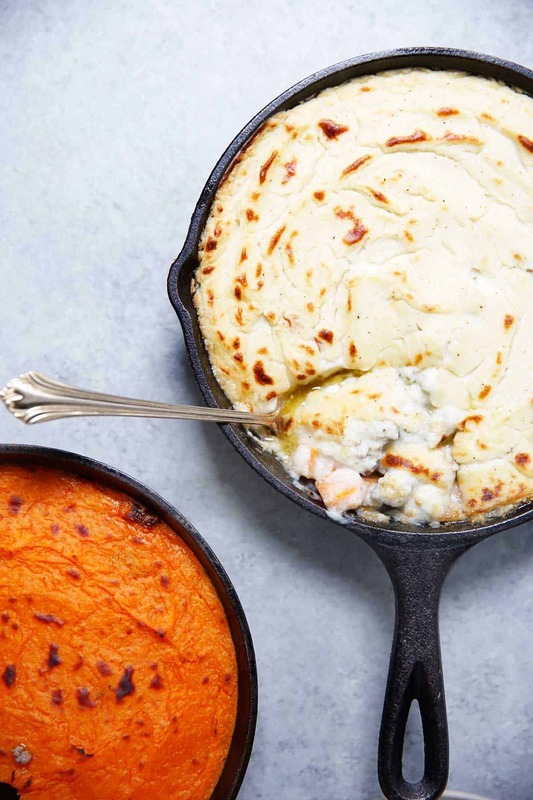 Top one cast iron skillet with sweet potato mash and the other with the cauliflower mash. Bake for 10 minutes and then broil on high for 5-8 minutes, or until the tops are golden. 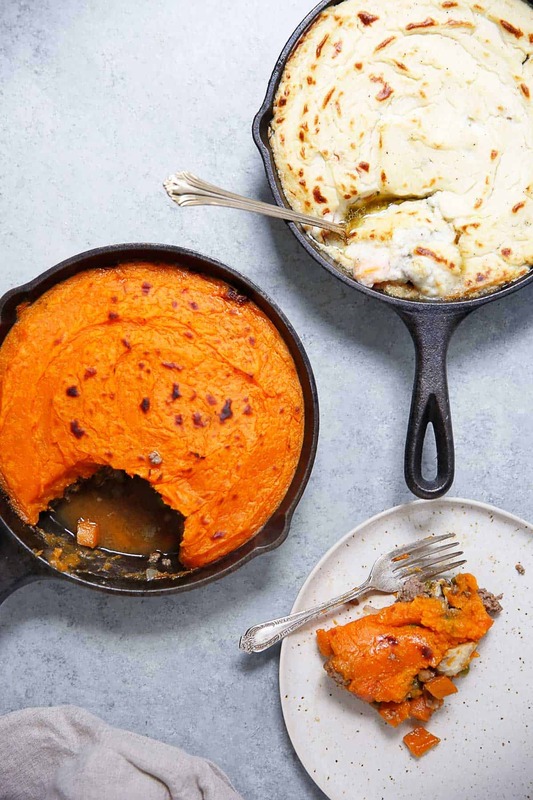 *For the sweet potato mash: Roast sweet potato at 400°F on a lined baking tray for 45-50 minutes, or until fork tender. Once soft set aside to cool before making the sweet potato mash. *Use ghee in the cauliflower mash to make it paleo-friendly! Just made this and it’s so amazing! Thanks Lexi! Sooo happy you liked! Which version? That looks phenomenal! 🙂 🙂 🙂 Mmmmmmmmmm love these! I made this for my post workout dinner last night and it was amazing! This was my first time ever making a shepherds pie and this recipe explains everything perfectly – no surprises lol. (I added a few pinches of cinnamon to the sweet potato mash for a little extra kick) Lexi for the win.. again! Tried the cauliflower version last night – DELICIOUS. Truly a great recipe for cold nights! Thank you. Wow, amazing recipe!!! I made the sweet potato version tonight and it such a delicious dish and super simple to make. Thank you!!! 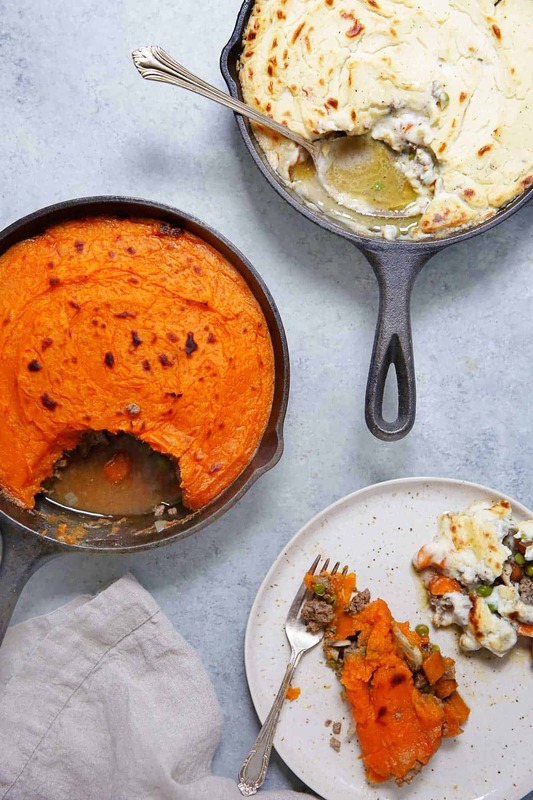 What a great idea, sweet potato on top of shepherd’s pie. In fact, any mix of root veg would probably work. Bit confused by the title though as being from the UK, Shepherd’s pie is made with lamb (Shepherds take care of lambs). If it’s made with beef its Cottage pie (because cows live in cottages!!!??) Lol. I don’t know why! Great recipe, but are peas paleo?… thanks! Delicious recipe, made it several times but you don’t mention when to add the mushrooms? Please let me know! I made the cauliflower version today and it’s seriously the BEST shepherds pie that I’ve ever made. So good! Looks amazing! Would love to make this for a crowd — maybe 12 ladies. I’m thinking I quadruple the whole recipe and put it it in 2 9×13’s. would that work?